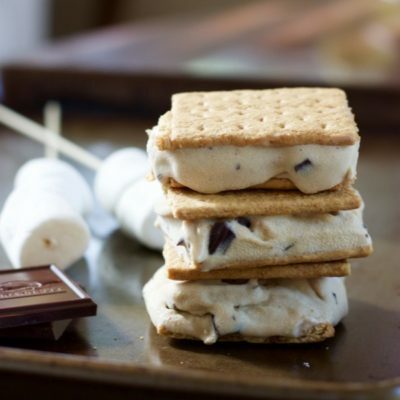 These Toasted Marshmallow Smores Ice Cream Bars have all that campfire flavor and perfect for a hot summer night. Vegan and dairy free. Preheat oven to 350 degrees F. Line baking sheet with parchment paper and generously spray with cooking spray. Arrange marshmallows on baking sheet and roast in oven for about 3 minutes until marshmallows are browned on top. In blender, combine coconut cream, coconut milk, and brown sugar and blend until sugar is dissolved. Add marshmallows to the blender and continue to process until combined. Pour marshmallow coconut mixture into ice cream maker and churn until it resembles soft serve ice cream. Add chocolate chips to ice cream and continue to churn until incorporated. Scoop ice cream out and divide among graham cracker sheets to form ice cream sandwiches. Place prepared bars in container to place in freezer to freeze fully.